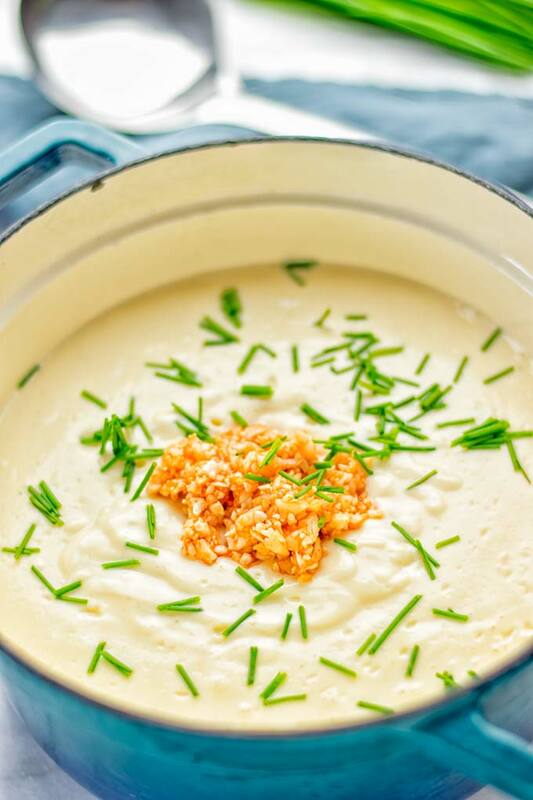 Amazingly satisfying, super delicious Buffalo Cauliflower Soup. Entirely vegan, gluten free and pretty easy to make. Buffalo Cauliflower is one of my addictions. It’s definitely a thing for me like with this Buffalo Cauliflower Lasagna or the Buffalo Cauliflower Taquitos. 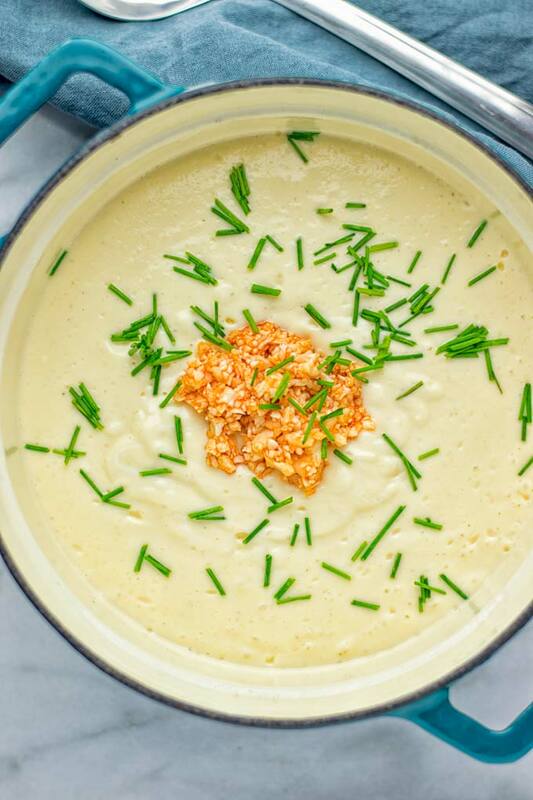 This Buffalo Cauliflower Soup is no exception. It’s creamy, addictive, perfectly spiced from the inside out, filling, low carb, super easy, and high in flavor. Made in one pot, hearty, super satisfying, healthy, and a must make for everyone, not only soup lovers. I promise. 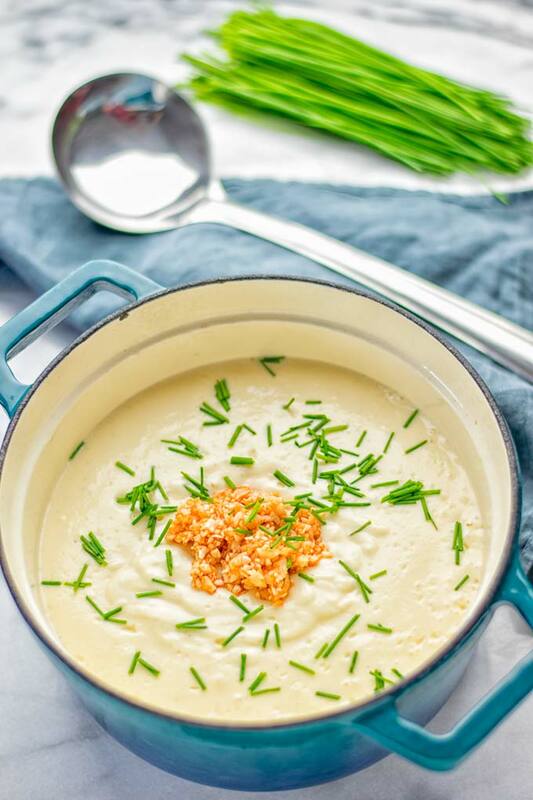 Cauliflower soup is traditionally made with cheese, butter, and cream. So never dairy free or plant based. I did something different with this Buffalo Cauliflower Soup. 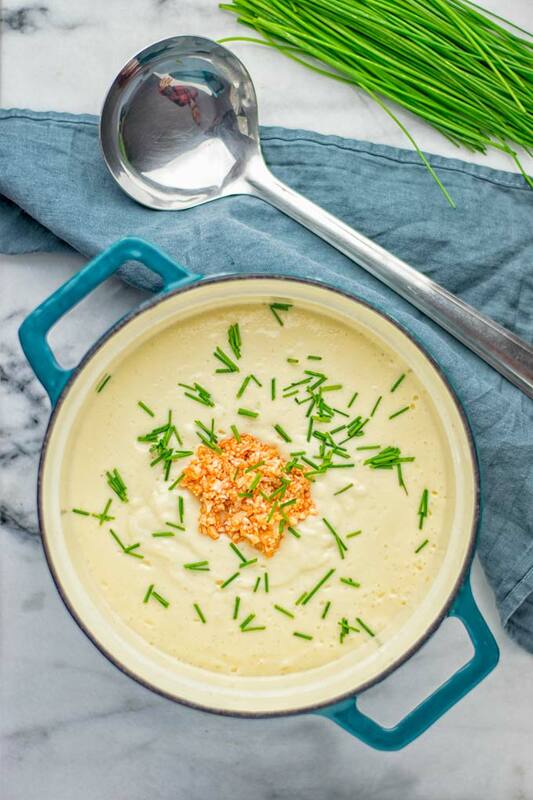 I used vegan creme cheese which will give this soup its super creamy texture. Also obviously there isn’t any cheese or butter involved, I keep it really simple. You can let the texture chunky or not. Just blend the soup with a blender, or immersion blender, to your preference. I keep it smooth and velvety with some texture. We use cauliflower for it and simply divide it. One to blend the soup and some for texture. I find it makes really the best texture for vegan soup recipes. Tried it entirely smooth and chunky, too. It was delicious but I find the mix of both really makes that taste and texture. First heat a pot with a bit of water. Bring to boil, then add cauliflower florets and cook until soft. Drain and finely chop 3/4 cup of the cooked cauliflower, mix with 1 Tbs of Buffalo sauce and put aside. Combine the rest of the cauliflower, 2 Tbs Buffalo sauce (or more if you prefer it really hot), vegetable broth and dairy free cream cheese, and garlic. Cook for around 2 minutes more. Then use your immersion blender and puree until really smooth and silky. Also you can use a high speed blender, if you like. Last, add the reserved cauliflower mixture to the soup and cook everything until warm. Divide into bowls and enjoy. 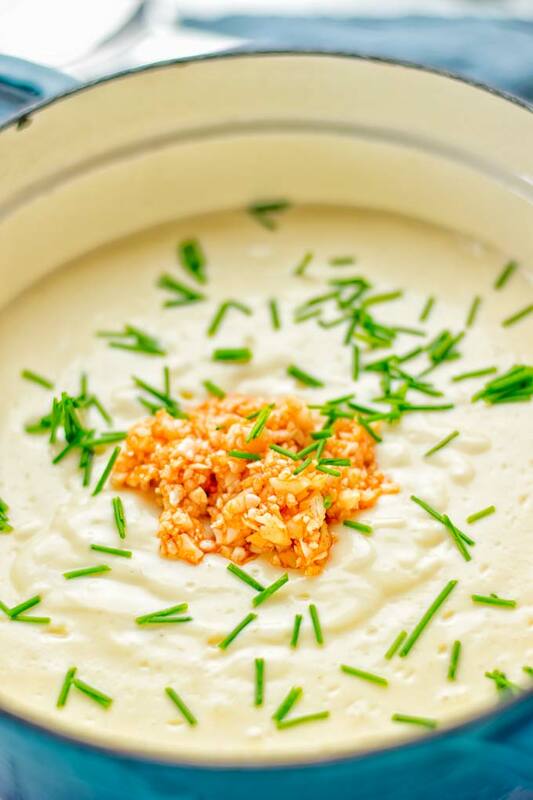 The Buffalo Cauliflower Soup makes an amazing appetizer, dinner, lunch in no time that the whole family will love. Seriously delicious on it’s own but if you like, add my Easy Jalapeno Cornbread to this. It only needs 5 basic simple ingredients that you already stock in your pantry. 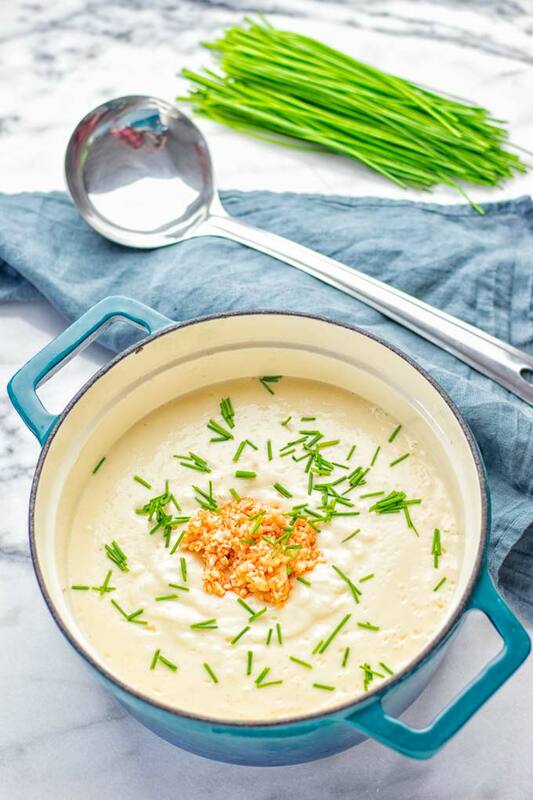 Also this soup is absolutely delicious to plan for meal preparing, work lunches, and even date night. Who does not love Buffalo flavors? Right, we all crave for more at any time. I found my vegan cream cheese at a local store, but if you have a hard time to find some, try online. Or go for another kitchen adventure and make it yourself. It’s really simple to make a dairy free cream cheese. All you need is cashews, almonds, or macadamias that’s all. Put 1 cup of nuts in a food processor. Add 1/3 cup water. Depending on how thick you prefer your cream cheese, you can easily add more water. But I find for me 1/3 cup is ideal, as it makes the texture thick and creamy, not too runny or too thick. Process until smooth and creamy. Now you have the base you can add some herbs, garlic, other seasonings to your liking and preferences. 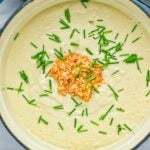 If you give this Buffalo Cauliflower Soup a try, tag me on Instagram or Facebook. Love seeing all your remakes. 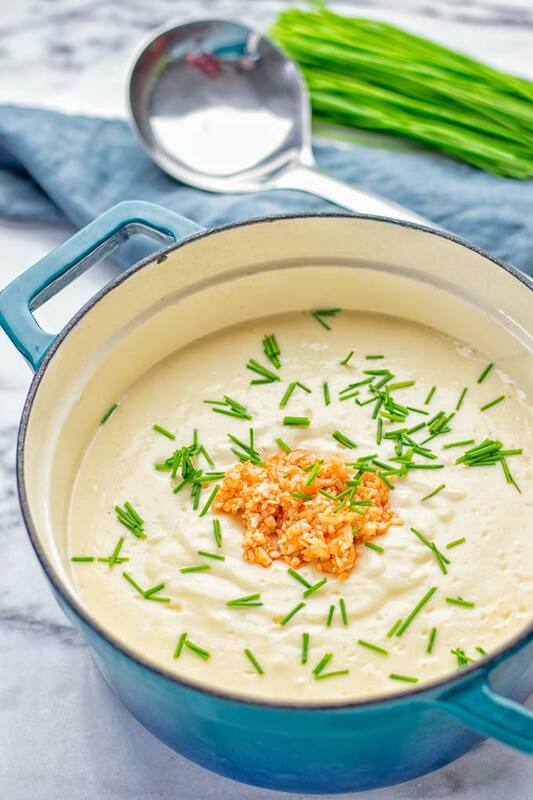 Combine the rest of the cauliflower, 2 Tbs Buffalo sauce (or more if you prefer it really hot), vegetable broth and dairy free cream cheese, and garlic. Cook for around 2 minutes more. Then use your immersion blender and puree until really smooth and silky. Also you can use a high speed blender, if you like.